Jason Kravitz (Brussels, Belgium) on 26 December 2006 in People & Portrait. 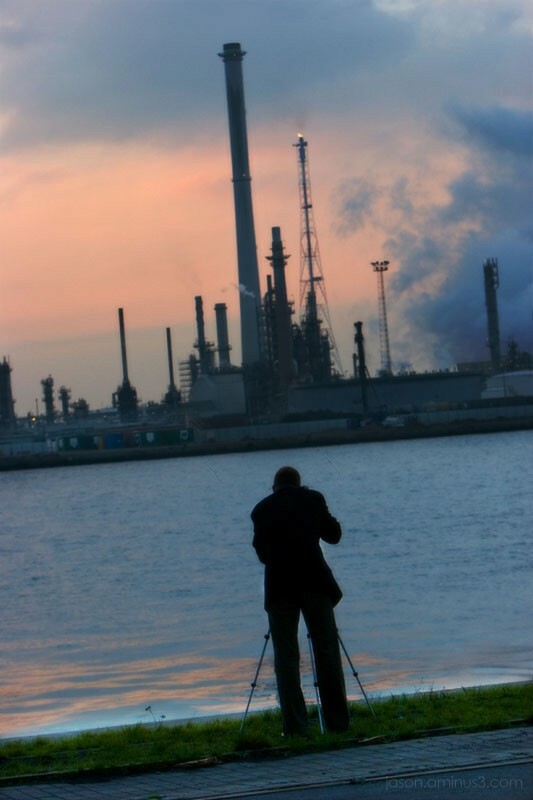 My friend Tim took me to Antwerp Harbor to take some industrial photos. Here is Tim setting up a shot. Interesting angle. I like the colours of the sky. Good shot! Evocative---large mass and small figure, strip of green grass holding photographter---great colors, a lot of power. Lovely, what a photo. Amazing colors and composition. Nice scene on worrisome environment! Great shot. Nice tilt, enough to throw things off in a good way. Looks quite a bleak picture, smokestacks reigning over li'l Tim! I get a very out of the ordinary feeling. love it. Muy buena toma. Me gusta mucho la inclinación de la cámara. The colours make me want to cry. Beautiful.